Though the Speedmaster was first launched in 1957, relatively few changes have been made to its design or its movement over the years. 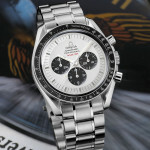 After all, it would almost be foolhardy to abandon the highly robust case design, totally functional dial and unbeatably reliable movement that were instrumental in helping the Speedmaster become the only chronograph to pass the most stringent tests ever devised for a watch by NASA Nevertheless, the special edition for the 35th anniversary of the moon landing distinguishes itself in its own original manner with a unique sapphire crystal case back on which the Apollo 11 mission patch is glazed in colour. The case-back ring bears the special inscription “Apollo 11 35th anniversary Limited Edition” as well as the limited-edition number (0001/3500). 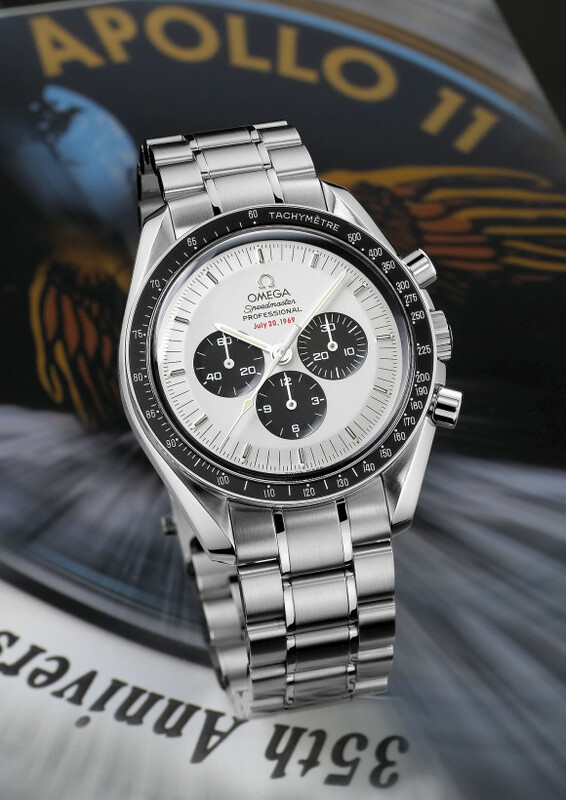 The limited-edition status is also confirmed by a subtle inscription below the Omega Speedmaster Professional name on the dial, mentioning merely the date of the Apollo 11 landing “July 20, 1969” in red. The Speedmaster Apollo 11 35th anniversary has a silver dial with applied hour markers with luminous dots and contrasting black counters for the continuous small seconds, 30-minute and 12-hour chronograph counters. It has the typical Speedmaster stainless-steel bezel with black aluminium ring bearing the tachymeter scale, rhodium-plated hands with SuperLuminova and stainless-steel bracelet with safety clasp. The movement is the classic Omega hand-winding chronograph calibre 1861, which has a 45-hour power reserve. It is a direct descendant of the original 321 and 861 calibres used in the very first Speedmasters and as such shares the same reliability and resistance that helped its predecessors withstand temperature fluctuations of over 100°C, shocks of 40g, acceleration of 16g and vibrations of between 5 and 2000 Hz during the NASA tests. In commemoration of the 35th anniversary of the first lunar landing, Omega is producing a strictly limited series of 3500 individually numbered Speedmasters bearing the Apollo 11 insignia. As mankind today explores even more distant horizons, with NASA’s Spirit and Opportunity Mars rovers currently stealing the headlines, these watches serve as a reminder of Omega’s long-standing association with space exploration – an association that the brand will continue with the quest to return to the moon and, eventually, travel onwards to Mars. This entry was posted in Press Release, Speedmaster Professional and tagged 3569.31.00, Apollo 11, Panda on May 1, 2004 by Dale Vito.